If you've never dealt with scales, I recommend kicking things off with the foundation of all scales… the Chromatic Scale. I'd then suggest moving right into the Major Scale, as this is the basis of every other scale in music. Once you've got the Major Scale down, it's up to you to explore the other various scales and sounds available to you. You'll find explanations, playing examples, backing tracks, and more in this section. You can learn more about the chords that each scale is built upon in the Chords section. Triads are the bedrock of all music. I've learned from the best guitar players in the world, and they have preached the importance of these three-part chords. I've analyzed the habits and approaches of the most legendary guitarists to ever walk the Earth, and I discovered one special common trait–their dependence on triads. Trust me when I tell you, triads are essential for guitar mastery, and they will improve your musicianship exponentially. Learn the chords that correspond with various scales presented in Guitar Super System. You'll have the opportunity to apply your scale knowledge over various chord progressions, but more importantly, you'll understand how to analyze harmony and construct chords and progressions of your own. You'll also find a huge compilation of chord shapes in multiple positions to fill your repertoire to the brim. You never know what new sounds will inspire you. Much like chords, arpeggios are built upon various tonalities and qualities of harmony. You can think of arpeggios as chords played as individual notes in a sequence. Once you understand the concept of arpeggios, you'll have a great time applying various techniques to them, such as sweep-picking, tapping, and more. Their uses in an improvisation context are almost endless, and can provide a burst of musical flavor in any genre. The best ear training exercises not only train your ear, but your knowledge of your instrument and where you can access different tonal character while still understanding the foundation of what you're actually playing. A strong ear can be a guitar player’s most valuable asset. This section is full of materials for you to practice on your own, including a variety of different chord charts to test yourself, as well as additional backing tracks for scale practice. This sheet music library contains a selection of some of my personal favorite jazz standards and reading exercises that are not only beneficial to improving your skills, but pleasing to the ear, as well. 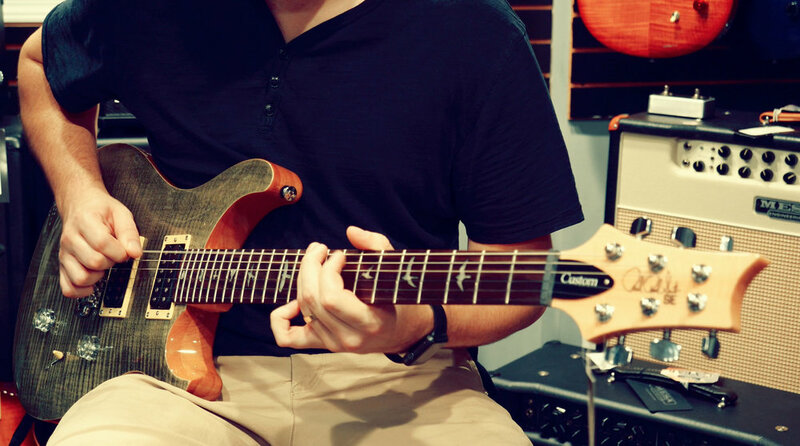 Understand the differences and effects of various time signatures in modern music. I'm a rock 'n roll guy, so some of these signatures will be delivered with a bit of an edge, but you can apply these concepts and tactics to any genre of music.